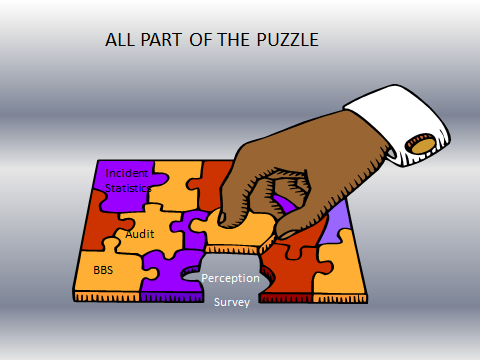 A strong health and safety culture is the missing piece of the health and safety puzzle. A strong health and safety culture is the missing piece of the health and safety puzzle. Why does health and safety excellence consistently elude some companies? Why do some companies experience high severity workplace accidents despite scoring highly on program audits and maintaining low accident frequencies? How do some companies achieve safety excellence without a formal health and safety program? What significant cause of safety program failure can cause safety professionals to seek alternate employment? The answers to these questions are important because they reveal the path to achieving health and safety excellence. Studies conducted in North America, Europe and Australia have concluded that fostering a culture of safety within an organization plays a critical role in achieving world-class safety. Some studies even go as far as to suggest that organizational culture is the missing piece of the health and safety excellence puzzle. An organization’s culture influences how employees behave at work. Culture influences whether or not an employee will choose to follow a personal protective equipment (PPE) directive or not. Ultimately, the culture determines how employees behave when the boss is not around. Organizations can’t sustain a good health and safety management system without a strong positive health and safety culture. Anybody with a green thumb will agree that if the soil isn’t fertile, a planted seed will not germinate and grow. The implementation of a health and safety program is similar to planting a seed. You can plant as many safety seeds as you want, but they simply won’t germinate and grow in an environment that is not fertile. Many health and safety professionals wear themselves out working for such nutrient-starved companies. They expend energy on safety activity but, like farmers sowing seeds in the desert, they don’t see any results. Often, it is the corporate culture that prevents them from succeeding with their programs. A safety program won’t grow and improve if the company culture doesn’t sustain or nourish the program elements. Safety excellence will always elude professionals who simply continue to do the same things they have always done at other companies hoping that one day something will play out differently than before. Many of them simply can’t take it any longer and quit. They move from job to job looking for a more fertile safety environment. Safety professionals who fail to understand the importance of workplace culture to their ultimate cause are doomed to live this nomadic existence. I believe that workplace culture is the single most important ingredient necessary to achieving safety excellence. One of the biggest career-limiting errors safety professionals make is when they fail to realize how culture influences employee behaviour. Unfortunately, culture is also an area that many health and safety professionals are afraid to tackle. I’ve been told by some company safety representatives that they are so busy getting their safety hardware in place that they don’t have time to sweat the soft stuff like culture. Little do they know, it’s the “soft stuff” that determines the degree of success they will have with their precious hardware. Here is an interesting point that may shed some light on the importance of structured safety programs. As a consultant, I have worked with hundreds of companies. In a few of them I’ve found health and safety amazingly alive and well and flourishing in spite of the fact that they have absolutely no safety programs in place. None! How is this possible? What this fact suggests is that as important as a basic safety program is supposed to be, it may not even be required if a company has a strong positive safety culture. In such a culture, safety is integrated into every company activity because safety is considered to be as important as other factors like quality, productivity and service. In leading companies, employees know the importance of safety. They don’t know this because the employer has crafted elegant policies and conspicuously posted them throughout the workplace. They know because all levels of company management consistently demonstrate with their actions that safety is a key value. Safety, for these companies, is not a program that management can cut when sales slump. Safety, quality, productivity, and service live in harmony in successful organizations. None of these key factors are vying for dominance over the others. Companies with strong positive cultures recognize that cultural factors like trust, open communication, job satisfaction, management credibility, and leadership, the same factors that affect good service or higher productivity or better quality, also affect safety. Let me emphasize the power of workplace culture to help achieve safety excellence with this true story. I recently conducted a health and safety management audit on a large oil and gas company. I interviewed a new employee who had only worked for the company for about 3 weeks. I asked him about wearing PPE and following general health and safety procedures. His response to these questions was that he always followed the procedures and always wore the appropriate PPE. He went on to say that whenever he saw an employee or contractor not following procedures or not wearing their PPE, he talked to them about it. This company didn’t have an expensive behaviour-based safety program to help encourage targeted safe worker behaviour. It didn’t have an extensive inspection program bolstered by frequent worksite visits by safety police. What the company did have was a workplace culture that said they cared for their workers. They had a culture that said wearing PPE and following procedures were a requirement of the job and not a policy to conveniently opt in or out of on a whim. Because this company had a history of enforcing the company principles without exception, they had evolved to a point where every employee willingly conformed to the company’s accepted safety norms. Employees were encouraged to follow the rules through the example set by their co-workers. The culture of this company had evolved to one that was strong and positive. How did this company achieve this kind of culture? I can tell you, from personal experience, that 10 years ago things were different for this company. As with most other companies, their safety program consisted of elements that met or exceeded the scrutiny of a basic audit. They had the expected safety policies and procedures and hazard assessments. They had incident statistics that won them awards within their industry sectors. What they didn’t have was a culture that demanded full compliance to all of the program elements and was supported one hundred percent by the management team. It wasn’t until they had a serious accident that resulted in worker fatalities that management began to seriously investigate into why the fatalities were occurring in spite of their seemingly excellent program. They discovered that it was their workplace culture that had let them down. They had allowed for too many exceptions to safety rules in order to improve productivity. This story isn’t a new one. It plays out time and time again at companies whose main focus is to reduce accident frequency. Many companies with a low occurrence of accidents are lulled into a false sense of safety excellence, making them complacent and susceptible to less frequent, but more serious, incidents. Too many companies think they have achieved health and safety excellence just because they have scored highly on an audit or have done an outstanding job of claims management. Reliance on these traditional measures of safety excellence has done them all an injustice. Do we have to first wait for someone to lose a limb or die before we come to realize that safety excellence is more than a stack of 8 or 10 elements piled one on top of the other? We need people, especially legislators, to understand that a culture of workplace safety is the piece of the safety excellence puzzle that they are missing. Culture needs to be a major focus of health and safety professionals if the elements of a program are to be implemented in a receptive environment. I do not want anyone to misinterpret my message here. I am not saying that safety programs are not important. I believe that they are. My message is that we are currently spending a disproportionate amount of time and resources on the area that, by itself, is the least effective. Without a strong positive safety culture, safety programs will never do what companies hope they will do. They will never achieve safety excellence or, for that matter, even safety mediocrity. Like the drilling rig analogy below, there’s a limit to what can be achieved by safety program elements alone. The most that can be achieved is a state of passive compliance. Where safety efforts truly pay off is when we drill down beyond the passive compliance level. Only by working on and improving the culture of safety within the workplace can companies ever hope to hit pay dirt. When we speak of culture we speak of safety factors that are less tangible than safety program elements. You can’t see cultural factors or touch them, but they can be measured. A perception survey is an excellent tool for measuring workplace attitudes towards safety. If they can be measured, then improvement opportunities can be identified. Improvement plans can then be drafted and put into place to improve workplace culture. North America is behind other industrialized countries in realizing the effects of culture on safety. Other countries such as Britain and Australia have already caught on to improving corporate culture. With this crucial element, their health and safety excellence puzzle is complete. It’s time for us to stop doing things the same old way and getting the same old results. It’s time to stop the nomadic wandering of safety professionals moving from one company to another frustrated in their efforts to improve programs. Let’s identify the cultural shortcomings of the companies we are working for now and work toward improving them. That’s the path that truly leads to safety excellence.